Founded in 1994, AESC provides program design and implementation, measurement and verification, and corporate sustainability services to utilities, regulators, public entities and private enterprise throughout the United States. Our staff includes electrical, mechanical, environmental, and software engineers, all of whom have a passion for energy engineering. We understand the regulated utility environment as well as the competitive world of commercial and industrial facilities. 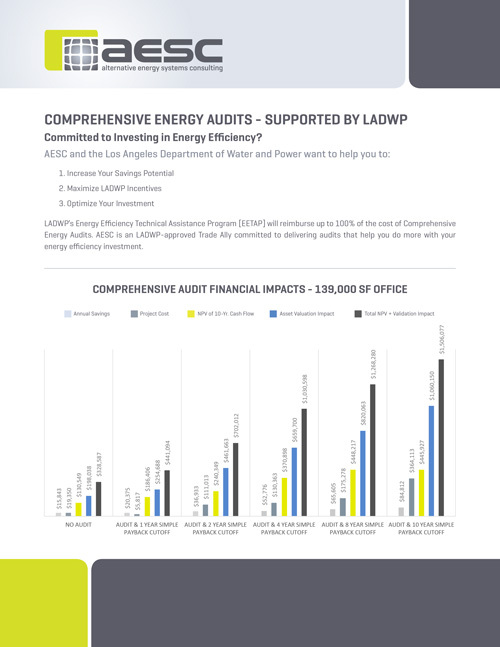 LADWP’s Energy Efficiency Technical Assistance Program [EETAP] will reimburse up to 100% of the cost of Comprehensive Energy Audits. AESC is an LADWP-approved Trade Ally committed to delivering audits that help you do more with your energy efficiency investment. As your EETAP audit resource, we’ll focus on your infrastructure requirements and financial goals. 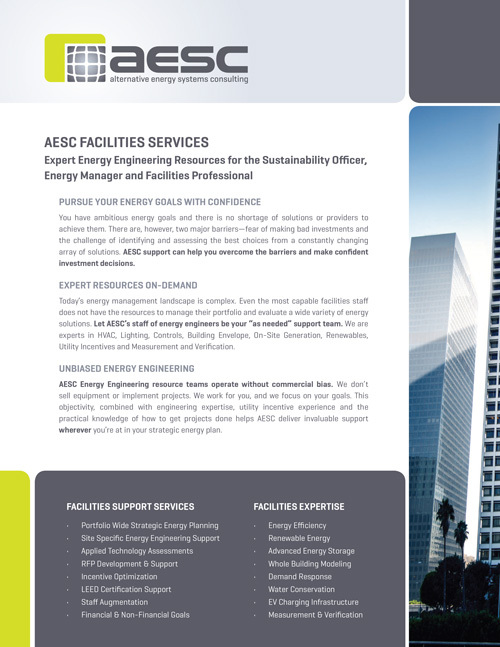 AESC offers expert energy engineering resources for the sustainability officer, energy manager and facilities professional. For more than twenty years, AESC has served commercial facilities on behalf of utilities and regulators. Our extensive demand side management experience and understanding of utility incentive programs makes us uniquely capable of evaluating your energy strategy and advising you as you consider various technologies and financing options. AESC is plugged in to help Oregon schools and school districts drive quality campus improvements. AESC is a qualified energy auditor and modeler under the state’s SB 1149 program, which provides funds for energy upgrades. AESC supplements the existing team of campus facility experts by identifying opportunities, providing project planning services, and maximizing grant funding for energy projects. When the interests of school administrators, facilities professionals, utilities, technology vendors, contractors, and bond managers align, successful projects are the result. 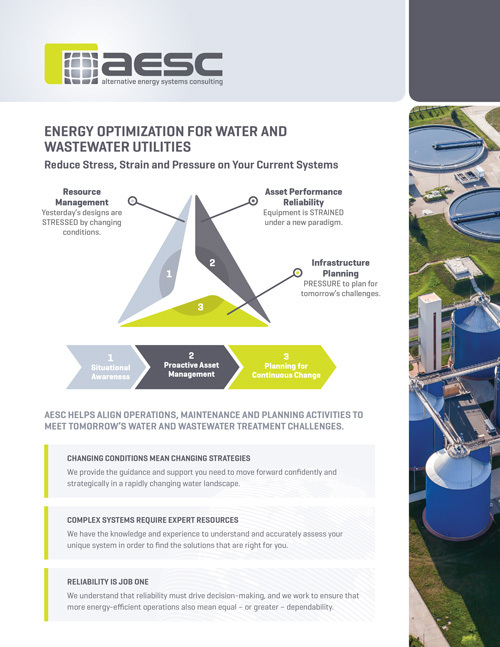 AESC helps align operations, maintenance and planning activities to meet tomorrow’s water and wastewater treatment challenges. Enhancing your company’s performance requires a comprehensive effort in reducing energy waste and optimizing organizational systems. 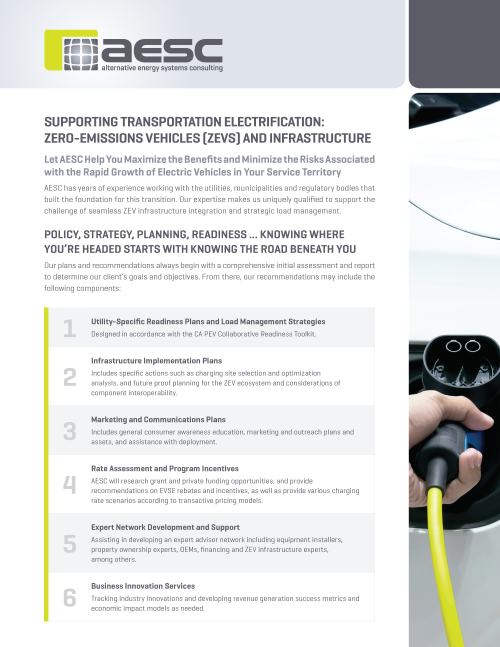 Strategic Energy Management (SEM) offers companies a proven framework to reduce energy costs, pursue continuous improvement, meet carbon goals and increase the bottom line. 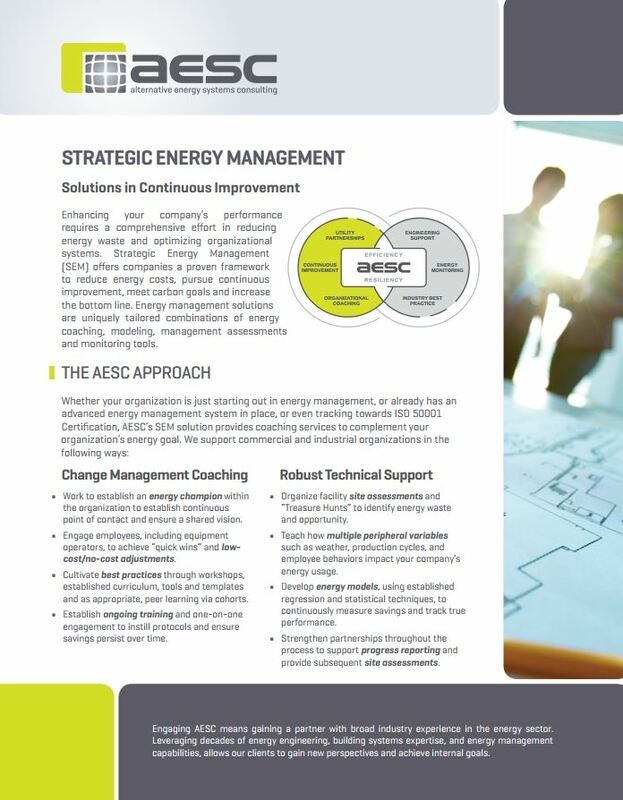 Energy management solutions are uniquely tailored combinations of energy coaching, modeling, management assessments and monitoring tools. Retrocommissioning (RCx) is a process that optimizes a building’s heating, ventilation and air conditioning (HVAC) system performance to improve efficiency while meeting operational needs. 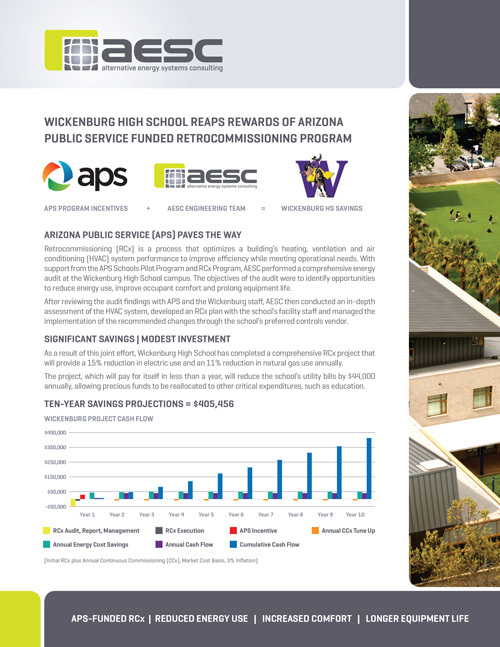 With support from the APS Schools Pilot Program and RCx Program, AESC performed a comprehensive energy audit at the Wickenburg High School campus. The objectives of the audit were to identify opportunities to reduce energy use, improve occupant comfort and prolong equipment life. 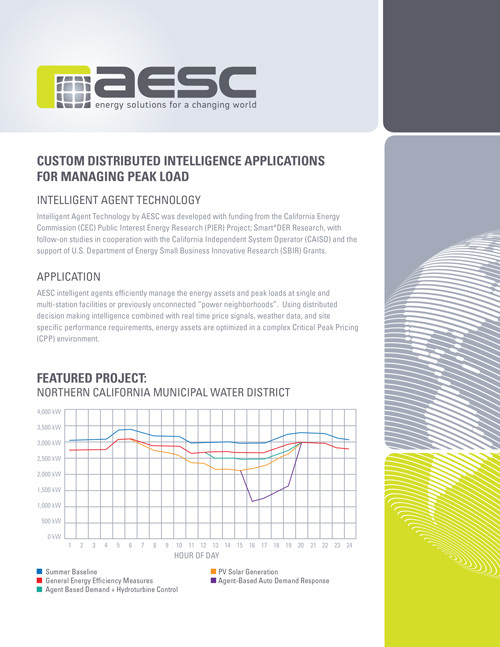 AESC intelligent agents efficiently manage the energy assets and peak loads at single and multi-station facilities or previously unconnected “power neighborhoods”. 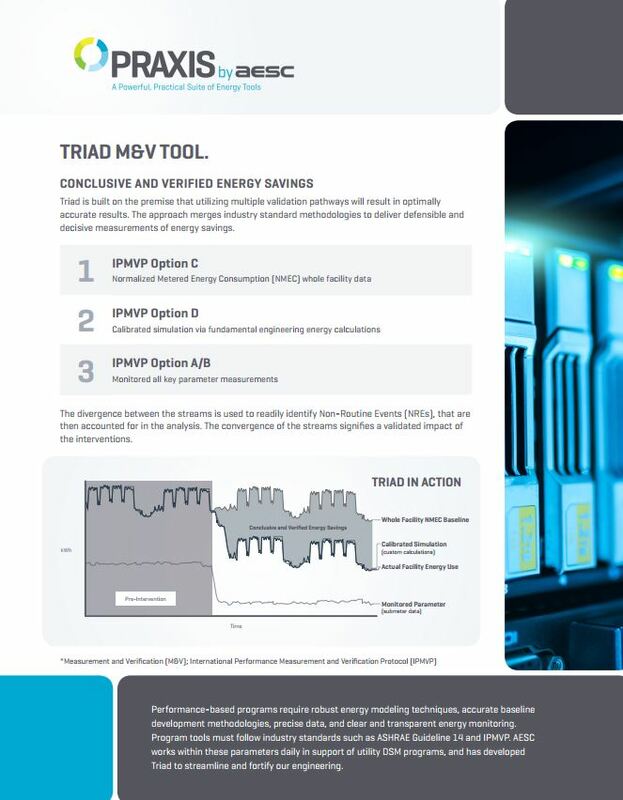 Using distributed decision making intelligence combined with real time price signals, weather data, and site specific performance requirements, energy assets are optimized in a complex Critical Peak Pricing (CPP) environment. Performance-based programs require robust energy modeling techniques, accurate baseline development methodologies, precise data, and clear and transparent energy monitoring. Program tools must follow industry standards such as ASHRAE Guideline 14 and IPMVP. 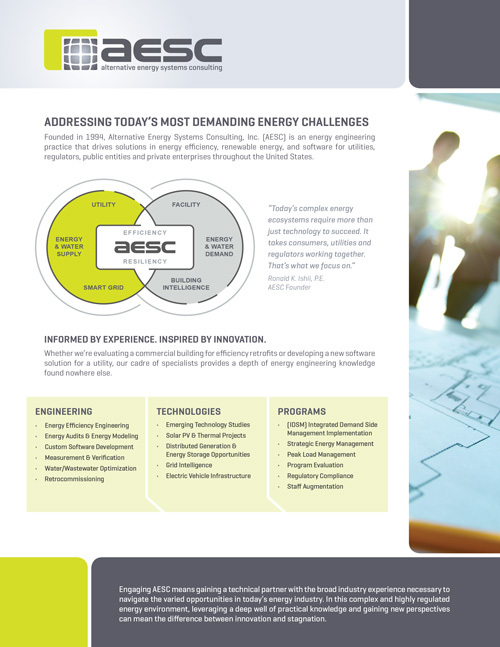 AESC works within these parameters daily in support of utility DSM programs, and has developed Triad to streamline and fortify our engineering. Praxis by AESC is a user friendly, customizable software platform that accelerates utility programs and accommodates a variety of technical and non-technical users. 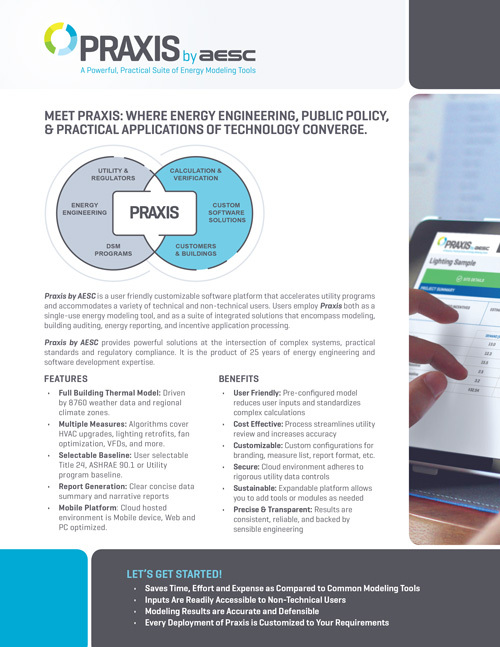 Users employ Praxis both as a single-use energy modeling tool, and as a suite of integrated solutions that encompass modeling, building auditing, energy reporting, and incentive application processing. The calculation engine behind Praxis is driven by decades of energy engineering expertise, a comprehensive understanding of building systems, and calculation tool development. Policy, strategy, planning, readiness … knowing where you’re headed starts with knowing the road beneath you. Our plans and recommendations always begin with a comprehensive initial assessment and report to determine our client’s goals and objectives. 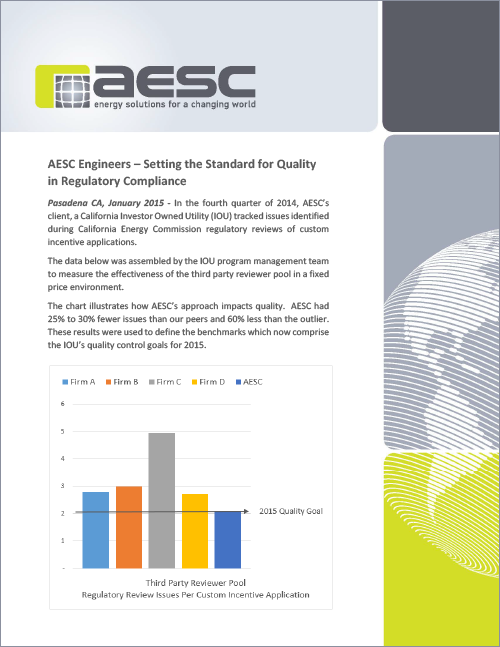 AESC Engineers are setting the standard of quality in regulatory compliance. AESC’s work as technical reviewer and support for utility DSM programs was recently evaluated by a California IOU. AESC’s work was found to be the best pool of reviews and standards.